Spending the Summer at York Lodge – Not Recommended! It is so hard to believe that my last post was 26 August! Since them we have been blessed with 12” of rain that was desperately needed. We now have great cell phone service thanks to Clay working all during the month of August trying 4 different Cell Phone Boosters, and climbing his 60’ tower 10 times! Pretty good for a 74-year-old!!! I will now get back to doing more posts on my Blog. I will do more updates on projects as I make progress. I found that I had to get away from the Computer in order to focus 100% on York Lodge. I have been working on York Lodge since late June. I wanted a challenge and boy did I ever find one! In my last post on 26 August I discussed the precision required to make this quilt. I never thought I would really get through the 30 blocks. Heck, I loved this project so much that I made and/or prepped at least 45 blocks (12 made it to the trash can) and the remainder never even made the finish line. I had a lot of interruptions during the process of making this quilt in July and August. This quilt requires 100% dedication, and no interruptions. 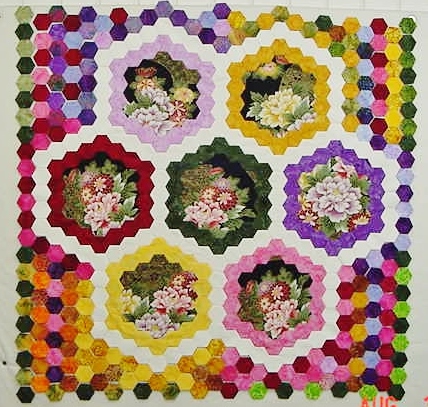 One would have to go on a month-long quilting retreat where Life stands still! Life seemed to get in the way and that is OK. I have enjoyed every moment making this quilt, even the days where I would spend 6 hours trying to make one block only to have it not turn out. I learned how to work with bias, precision cutting on a 45 degree angle, and most of all, S-L-O-W stitching. Today – 18 September 2018 – I finished the 30th block for the quilt. Now I am ready for the next step – try to figure out how to put the blocks together. When I as having issues with the blocks, I went back to the book hoping to find something I had missed in the directions. Was I ever surprised when I read page one again. 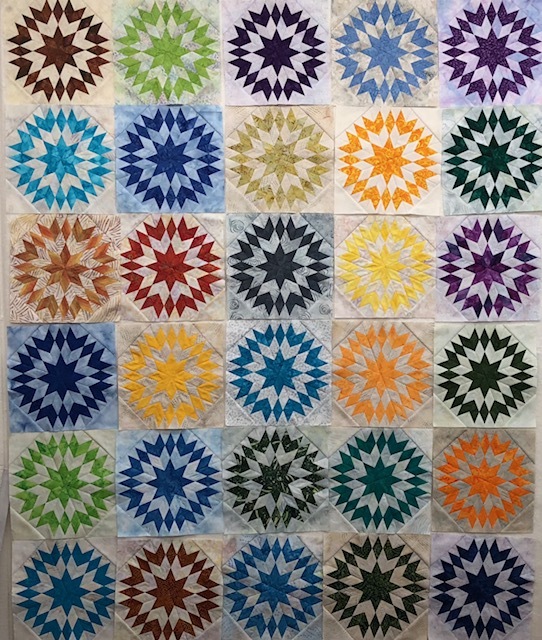 At the very bottom of the description of the quilt, the last sentence stated, …”in the original quilt not one of the blocks were the same size…” I can attest to this statement because my blocks range anywhere from 10 5/8” to 11” square. I wish I had seen the small print at the beginning! Oh well. Many memories made in making this quilt! I have two thoughts in mind that will allow me to square each block the same size. The pattern called for a light/white background sashing, but I will not use white. I am thinking that I will add a 2” border to each block that matches the individual block background and then either add a beige sashing OR I may put a border on each block that matches the color of each Star, square them the same, and put the quilt together. But the overall goal will be to make the Stars float! We will see what happens! I will continue to work on different UFO’s the remainder of the year. I have decided to not increase the size of Mountmellick! I am no longer interested in pursuing it any further. I have some border fabric left over from. Lu Ann who was so kind in 2015 to send me a remaining piece of the Di Ford border fabric for Mountmellick. I will be making a mitered border and MM will become a nice Wall Hanging! – This will make 3 more finishes since July! YEA! The next UFO that I will be working on (after completing the York Lodge flimsy) will be my Brinton Hall. I started this project in 2015. The quilt pattern is in Quiltmania Magazine Number 107 and 108. I will be using Asian prints for most of the quilt. Here is a picture of where I last left with this project. I need to finish sewing the hexagons for the corners and then I can progress to the rest of the quilt. This is the Center Medallion. I will use this project as my day time work. There are a lot of blocks to make which will keep me busy. Here is a picture of the quilt that was featured in Quiltmania Magaine. Looks like I may have started this one in early 2015. 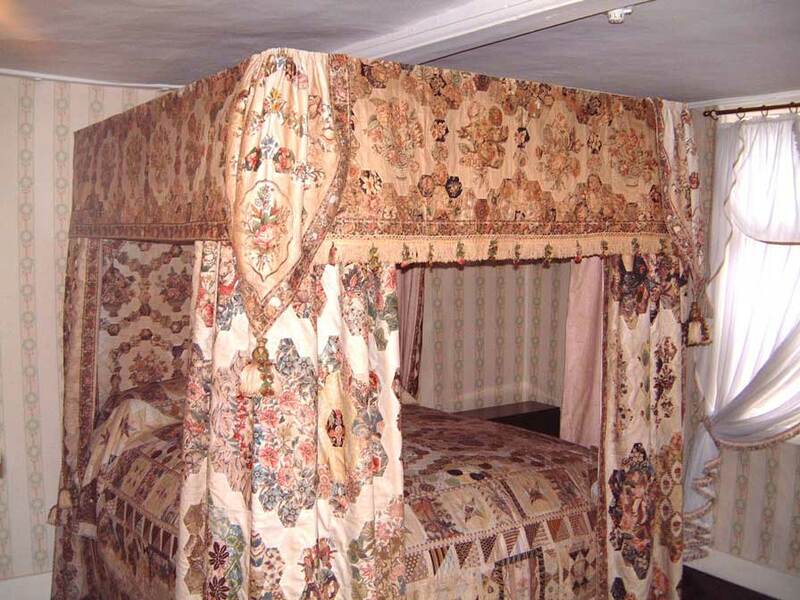 Here is a picture of the original quilt. And I thought I was OCD with York Lodge! My friend Lori from Quilting Needs is experiencing the loss of her Sister. They have taken her off life support and Lori saw her this afternoon to tell her goodbye. This is such a traumatic loss for Lori. Lori has really had it tough when it comes to losing loved ones. If you keep up with her on her blog, keep her in your prayers. We were watching the movie The Debt and one of the characters played the piano and was playing Beethoven’s Moonlight Sonata. I realized that I really how much I missed playing the piano, especially the Methodist Hymns and Moonlight Sonata. My Mother was an accomplished Pianist, a Smith marrying a Chopin! I started piano lessons when I was 6 and trained in Classical music. I am rusty, but it was very relaxing for me to go play for an hour or so and I really needed it last week. I am going to make time in my schedule for practicing Moonlight and my Hymns. Love this post especially the way you challenged yourself, persevered and succeeded in completing these beautiful albeit complicated blocks. And then found your way back to your music! Thank you Jocelyn. I loved it even when I kept telling my hubby that I was sick of the quilt! LOL. I give you a lot of credit for perseverance with all these very complicated projects! I know I would’ve given up on York Lodge long ago . . . Thank you Kerry! I achieved my goal, and regained my ability to focus on something until finished! Wow, you actually got all these blocks pieced! I would have given up a long time ago. You are one persistent lady. Enjoy the simple task of adding sashing to the blocks and getting that project into a flimsy! Happy stitching! Oh Lisa! I had so many issues with the blocks. Each and every step taken in a block has to be so precise! I know that I would have made a total of 50, but when a block just had too many issues it went in the trash. And I could not for the life of me understand why. Who designed this block, and did you and Lou make the quilt in the book? If so, did you have problems with it? Any insight would be great! Lou made the quilt in the book. I did one block as a test block to make sure our maths worked. we did not have any issues with it sorry. It does require very accurate cutting and piecing though with so many diamonds. we were both given 3 antique blocks from a cut up quilt so the block was drafted from them. Not for the faint hearted this quilt, and we think you have done an amazing job. Thank you for the nice compliment. This quilt takes time, precision sewing and cutting. Any interruptions while working on a block is not good. The process I developed took a minimum of 5 hours per block. I found a Creative Grid quilt ruler about 15 blocks into the project that really helped. This quilt is made in Batiks so in order to make sure that the fabric did not slip while cutting, I taped the strip sets down and it worked so much better. It should be labeled as an Advanced level not an Intermediate level quilter. Have a great day. Thx for responding. Roseanne, Kellie passed away this morning. Lori is so torn up. She was so close to Kellie. I had given her the Doggie quilt that she quilted and Kellie loved it. Lori called and asked if the quilt could go with Kellie and I told her YES! I had a dear 2nd Mother that on the day she passed I had just finished a Butterfly quilt for her. It was placed in her casket. This is just so sad for Lori – she just did not need to lose her best friend and Sister. So sad for Kellie’s family! You did not ask… BUT…. as you were explaining your thoughts my thoughts were a colored box around each of those starts makes it chopped up….. and why are they all lined up like soldiers…… if it is to float ….. float it away….. keep up with trying options. I know you will find a super final setting. now about that 2015 project….. I have the same one around here “somewhere”. I am close to finishing the Brinton Hall Medallion, just need to focus. I will do a post to show where I am going with the stars and they will float! Thx Susie for your comments. It was worth the wait to see these gorgeous pieces… no matter what you do they will be fantastic! Hoping to have the top completed within the next 5 days. Easy work now. Thank you! Congrats on finishing those York blocks! More importantly, how wonderful for you to find your happy place again…even to the point of wanting to play the music! Sooooo good! Thank you Laura, I am so far behind on my email and reading posts! I will catch up soon! It will be a few more days of York Lodge and then I plan on playing my music for relaxation. I will do and thank you for nice words. Wow! I love those York lodge blocks! You sure picked same challenging projects.😀 thanks for the update on Lori’s sister,I’ve been thinking about her today. I happen to be one of those who love math. Most of the quilters I know hate it. And I can see something off immediately. We also have rotten broadband internet service and it isn’t getting any better. We have great service now and were able to eliminate the Verizon Home line service. Rural are the most ignored. Our internet speed is about 2.5 Mpbs download! At least the phone provides faster download! We do not watch TV or movies on our phones or iPads so that is not a problem. Have a great day and thx for the great comment. Wow – that Brinton Hall ensemble is phenomenal. What a stupendous amount of work is in that! I think it’s pretty amazing that you have all your York blocks made, and I really like both of your ideas for resolving the varying sizes issues. They would create two different looks, but both seem really nice in my mind’s eye. Sorry for the late response! I just finished putting the flimsy together last night! Next is to decide on a border. The original pattern does not call for a border, but I need to do one. It was a relief to finish. Brenton Hall is one that I really want to get finished. There is not that much left to do on the hexagons, just need to focus on it. Thank you for the nice comments. Have a great week!